The 100 Metre Diet 2.0: Organic Eggs? I've been searching for an organic chicken feed supplier for quite awhile now and I finally found one in Guelph. We currently pay around $11.75 per 25kg bag of regular non-organic chicken feed. As you might expect organic chicken feed is significantly more expensive at $26.95 per 25 kg bag. I really like the idea of switching to an organic feed but I am not thrilled with the idea of having to charge more for the fresh eggs we sell to our neighbours and friends. We currently charge $2.50 per dozen for our eggs. At that price we almost, but not quite, cover our feed and supply costs. Moving to an organic feed would equate to a price of around $5.75 per dozen. Would people pay that much for fresh free range organic eggs? I think I'll give organic a try and absorb the costs for now. Our new hatchery chicks will start laying in September and I'll be looking for new customers by then. I think I'll place an ad on Kijiji and see if there is any interest in organic eggs. Here in BC organic eggs from the grocery store are $6 sometimes on sale for $5. 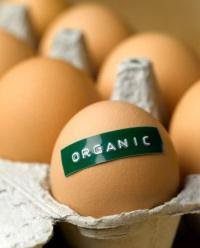 I try to get my eggs from a local seller when I can - organic are $4.50 and non organic $4 - I am happy to get either. The tough thing about local is that I have to make a special trip just for eggs. Would you have people come to you or would you deliver? One of our friends here takes orders from the local school teachers and then delivers once a week to the school. As you know I definitely think you're way undercharging for your current eggs - you deserve $3.50 minimum. But I can't see how you can break even let alone make a profit with organic unless you can source cheaper feed. Also, would you have to limit the (non organic) table scraps to the chickens to keep them on organic only feed? I guess my answer is I sometimes would pay that price but I don't think you should subsidize the cost of the eggs and also not get paid for your time and work generating the eggs. It shouldn't cost you money to provide others with high quality eggs. I know your family also eats the eggs so that's a personal choice of how much you want to spend. Say you produce 12 dozen eggs at a cost to you of 12 x $5.75 = $69. You consume 4 dozen and sell 8 dozen for $4 each generating $32. So you lost $14 on the eggs you sold. Add that $14 to the $23 it cost you to produce your 4 dozen and your eggs have now effectively cost you $9.25 per dozen. The costs will add up quickly. And still you're not factoring in your time at all.